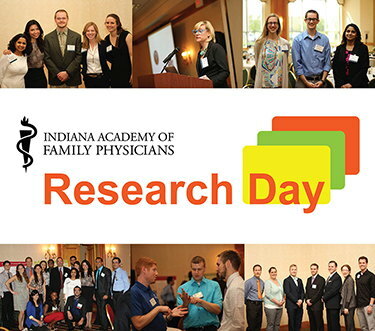 We invite you to attend the 2019 IAFP Research Day - an exciting showcase for the best family medicine research in Indiana. The meeting location will be the convenient Ritz Charles in Carmel, IN. Our agenda varies depending on how many abstracts are approved for presentation, but will run approximately from 10am to 4pm. We are now accepting abstracts for 2019's event. All IAFP members are invited to take part - student, resident, active, and life members. The abstract submission deadline was Monday, April 1, 2019, and the IAFP Research Day Committee has begun the abstract judging process. If you have any questions please contact Chris Barry. Residency Programs may register faculty and residents using the form below. Individual IAFP members may also use this form. The cost for residency program faculty/individual IAFP members is $75 for the whole day including lunch. Half day registrations are not available. There is no charge for residents. Register residents here - please type one per line including degree. There is no registration fee for IAFP member residents. Please do not register residents who will not be in attendance. Please notify us of cancellations at least 36 hours prior to the program. Register directors, faculty, and/or staff from your program here - please type one per line including degree. Please note that there is a $75 per person fee for this category, and no half-day attendance fees are offered.